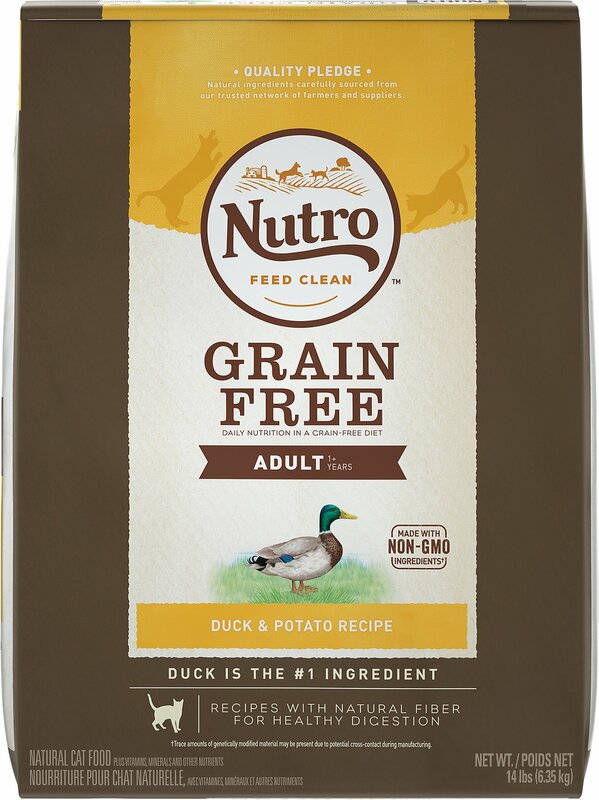 Give your kitty the grain-free goodness he craves and thrives on with the Nutro Grain-Free Adult Duck & Potato Recipe Dry Cat Food. 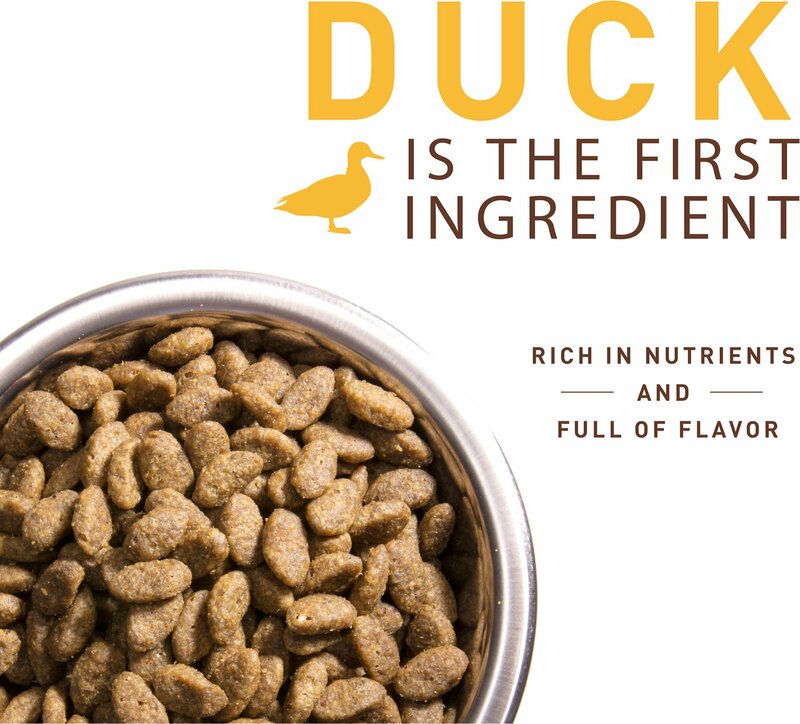 Made with duck as the first ingredient, it’s clean nutrition in every bite with plenty of protein for healthy muscles and flavor to keep him satisfied. It’s packed with everything your pal needs to look and feel his best, like antioxidants for healthy immunity, omegas for a lustrous coat, and essential taurine for heart health. 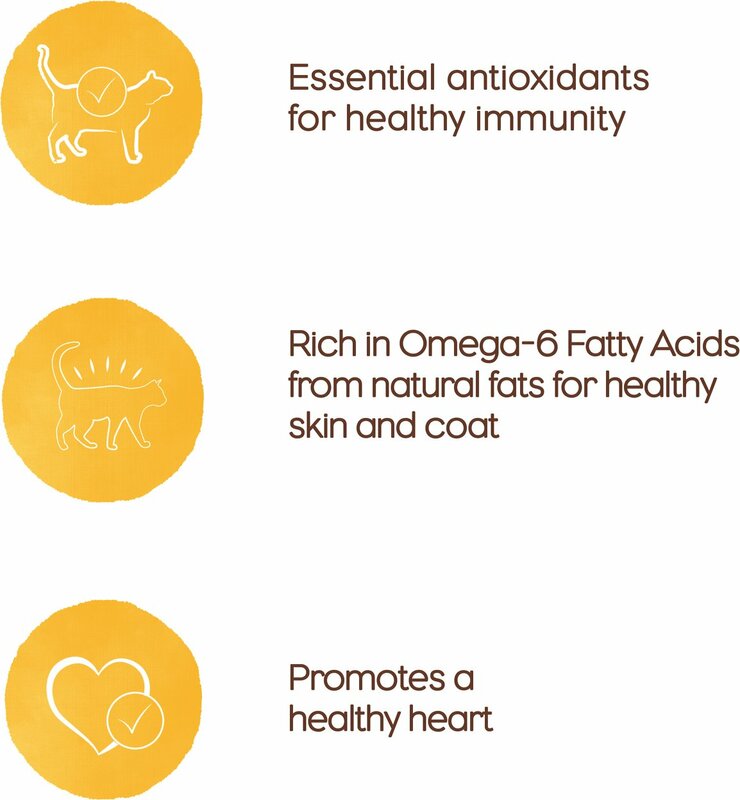 Plus, you won’t find any grains, chicken by-product meal, corn, wheat, soy, GMOs, or anything artificial – which means you can feel good about pouring it on, and sensitive kitties can dive into their bowls, too. 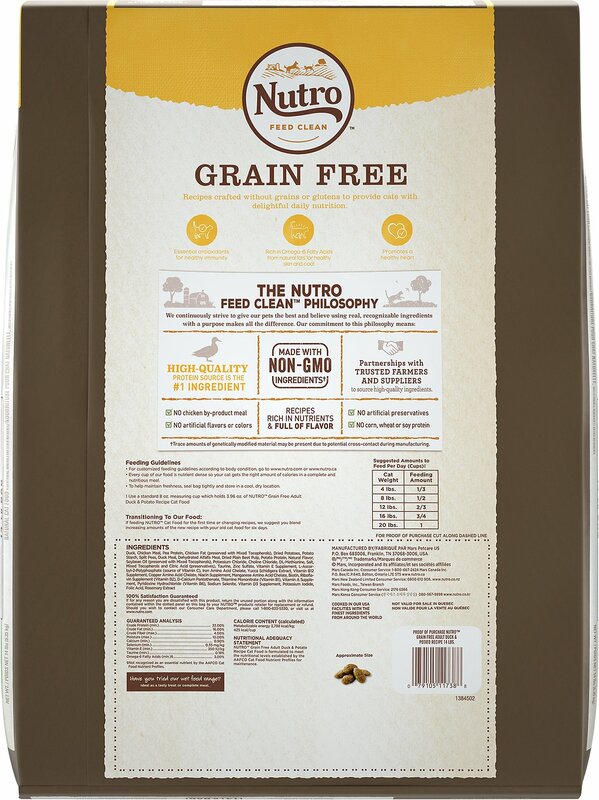 Made with duck as the first ingredient for high-quality protein and non-grain carbs for sustainable energy. Fortified with vitamins, minerals, antioxidants for immunity, omegas for a healthy skin and coat, taurine for a healthy heart, and natural fiber for healthy digestion. 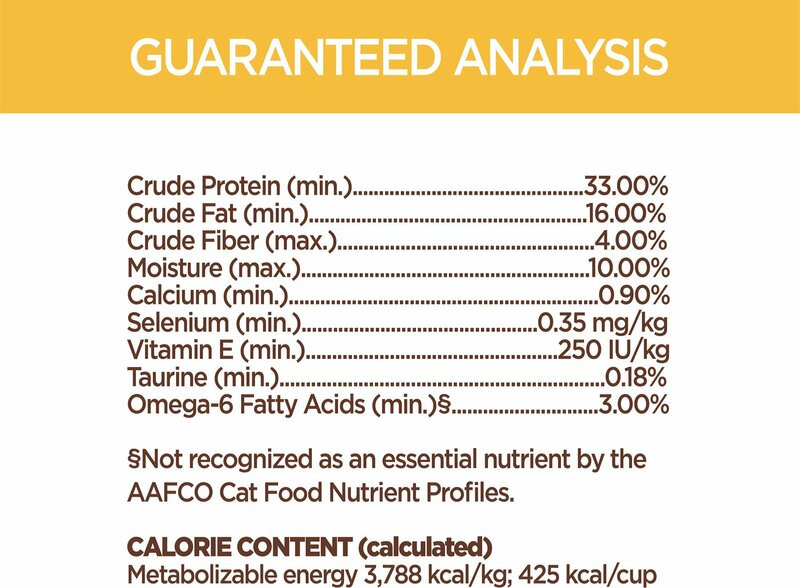 Zero grains, glutens, chicken by-product meals, corn, wheat, soy, or GMOs so it’s also ideal for cats with sensitivities. I have 4 cats; one that has ibd. This is one of the few dry foods without grains and fish. He loves the food. The bonus is that the other 3 cats also eat it. How often does that happen? The only issue I have is that the 'Best By' date is 03/07/2019 Lot # 810D2VIC08 and this food was delivered on 02/05/2019. Would be okay if I was using this food as soon as it was received since I just got the small bag to try, but you never know exactly when you're going to finish off that old bag, so a 1 month 'best by' date is not far enough out. I love this stuff. It helped my 4yo male cat lose some weight when I switched a few years ago and we lived in a small apartment. Vet says he is super healthy and she approved of Nutro. I’m very happy with the grain free options. I'm always trying new foods with my love because she likes variety. This is one of the dry foods she'll actually eat on a regular basis. What I like about this one is it aids with her digestion. It also helps to keep her stool firm, not soft as well as give it a normal color. Some foods can make your cat's stool funky. When I could no longer purchase this flavor at the store, I was thrilled to find it at Chewy! My cats can’t get enough of it! I have 3 cats - two outdoor and one outdoor/feral. For all, I mostly feed wet food, but supplement with dry and/or leave out a bit of dry food so that they can snack during the day. None of them are overweight, and they really seem to like having having the dry food available. They love this Nutro duck and potato recipe so much that sometimes I wonder if they'd actually prefer it to their wet food. They usually aren't this enthusiastic about dry food, so this is definitely a winner. 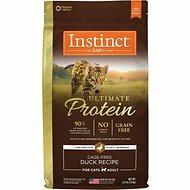 My 2 cats LOVE this food! I have an automatic feeder and they usually leave a little in the bowl after it dispenses the food. 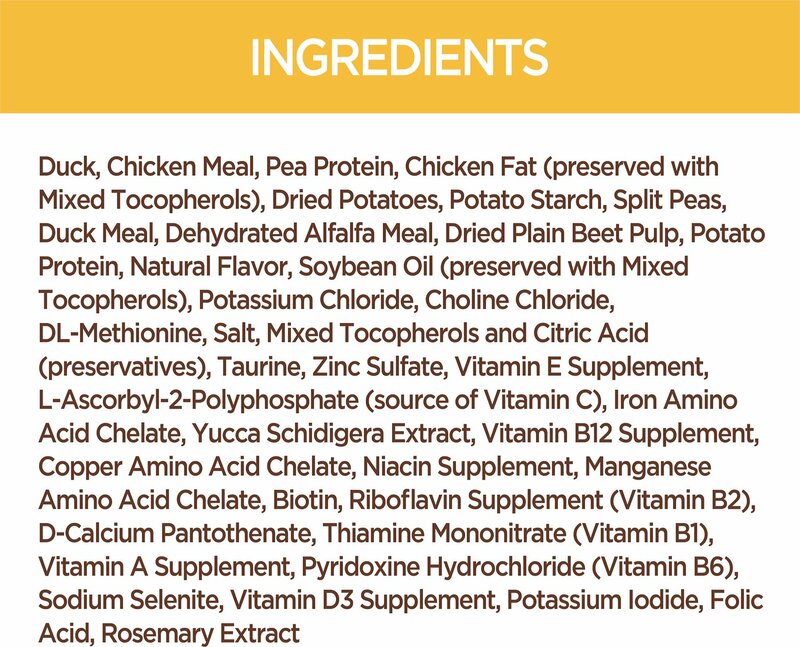 With this food and flavor, they eat every single bit. 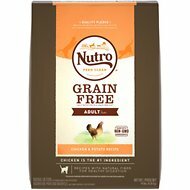 If I mix this with another food, they pick out this food and eat the Nutro pieces first. Taloose is a very picky cat. She used to eat only one kind of cat food and NO people food. When the other company changed their recipe and I changed to Nutro, I was afraid that she would turn up her nose. Not so. She wakes me up EVERY morning at 4AM to get some - not a lot - of her Nutro in order to go back to sleep. She is relentless, so now I just get up and give her a handful so that we can both get some sleep. 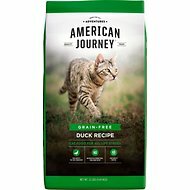 I decided to try a grain free food for my cat. He digests it easily and loves the flavor. My cats enjoy eating the flavors so far and I stick with the Nutro Brands.